Whilst just about everyone expects a proposal on Valentine’s Day, sometimes it can be just a little too, well, obvious moment. Yes, it’s the most romantic day of the year (if you’re into red roses, heart balloons and thoroughly overpriced Valentine’s cards) but you’re not bothered by the idea that there is a ‘right’ time to propose. And thus Easter, considered one of the least popular engagement proposal moments, is your appointed time. Provided she isn’t overly religious (you don’t want to clash with the commemoration of the death of Jesus) you’ll have the surprise factor to your advantage. A little word of advice: avoid the out there, unusual attempts at proposing if you can. Asking her if she’ll marry you whilst bungee jumping from the Gouritz bridge might have phenomenal kudos when repeated to your mates, but unless she’s up for it, things could go seriously awry. You could always try sky diving instead (slightly more delay before hitting the ground). Cook her dinner – as far as scoring brownie points goes, this idea is up there with bringing her breakfast in bed; you virtually can’t go wrong. Take the time to set the ambience – soft lighting, candlelight, her favourite music, food from the deli round the corner – and she’ll be putty in your hands. Easter egg hunt – the idea is that the ring is inside one of the eggs, or if you can find a plastic, wooden, or even handmade egg, all the better. Use a little imagination and this could end up being a lot of fun for both of you. Use poetry and flowers in amongst the fine chocolate eggs, and by the time she finds the ring, she’s yours. The long weekend away – this is not the cheap version, but then you are asking her to marry you. Plan a long weekend away from it all at a wonderful hotel, guest house of your choice, hopefully somewhere incredibly romantic. Place the ring in a glass of champagne, dessert of your choice, on her pillow. 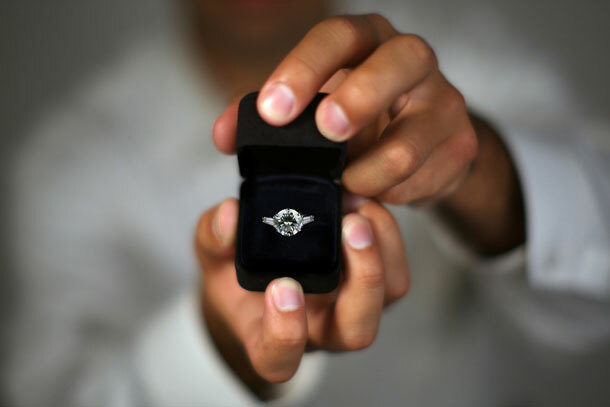 One For The Guys – Surprising Her With a Ring When You Propose?